Barcelona left-back Lucas Digne is reportedly on the verge of a move to Everton after he was allowed to return home from the club’s pre-season tour to wrap up a deal. The 25-year-old was always going to struggle to establish himself as the first-choice left-back for the Catalan giants given the ongoing presence of Jordi Alba. However, the Frenchman did make 46 appearances across two seasons with the La Liga champions, and so he did make an impact to an extent after his move from Paris Saint-Germain in 2016. Nevertheless, it looks as though his stint with Barca is coming to an end with AS reporting that he has left the rest of the squad on their pre-season tour in the US and will return to Europe as he looks set to complete a €20m move to Everton. Importantly, it’s added that with that fee, it essentially allows Barcelona to recoup the fee that they spent on the French defender, as noted on their official site when announcing his arrival, and so while perhaps there is disappointment that they couldn’t make a profit, at least they didn’t take a financial hit on the transfer. 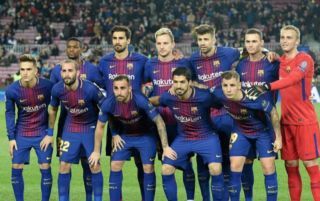 In turn, it remains to be seen whether or not those funds are now used for additional transfer business before the deadline next month, with Ernesto Valverde looking to ensure that Barcelona compete on multiple fronts next season with the continuation of their domestic dominance arguably the minimum expectation. Barca have already officially unveiled Clement Lenglet, Arthur and Malcom so far this summer as they seemingly look to get younger given all three are in their early 20s, and so it remains to be seen whether or not Digne’s exit sparks more movement in the market.